crowleys quay, kinsale, co. cork. Fishy Fishy Restaurant Gift Vouchers make the perfect gift for any occasion. The lucky recipient will be able to enjoy dining at this award winning restaurant and can also use their voucher to purchase a signed copy of the Fishy Fishy Cookbook should they wish to take away a memento from their dining experience. Click here to purchase a Fishy Fishy Gift Voucher online and have it delivered immediately to the recipients inbox with your special message, or alternatively you can have it sent to your own inbox for emailing on or printing. A perfect gift all year round! Martin is always keen to get people cooking and enjoying fish. With this in mind he has co-written several cookbooks which pass on his popular fishy fishy recipes and helpful tips about cooking with fish. 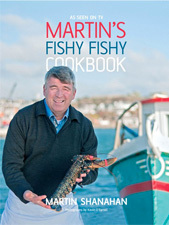 Available to buy at Fishy Fishy restaurant - Don't forget to ask Martin to sign your copy if he's in the restaurant. Featuring recipes that have made Fishy Fishy Cafe one of Ireland's most successful and acclaimed restaurants, as well as dishes Martin has demonstrated in his popular television series Martin's Mad About Fish. This is the classic book of modern Irish fish cookery, and your guide to great fish cookery in your own kitchen. 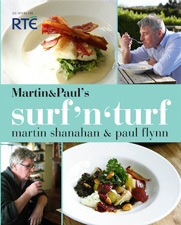 Includes 80 recipes for the fish and meat dishes cooked by the Martin & Paul on their travels around the coast of Ireland for their Surf 'n'Turf TV series. The Seafood Lover's Cookbook features Martin and Sally McKenna's contemporary, simple and hip seafood recipes, as well as a brilliantly useful shopping guide to the leading fish retailers throughout Ireland. There are also numerous helpful tips about cooking fish, and an extensive glossary of all types of fish available to buy from fishmongers in Ireland.